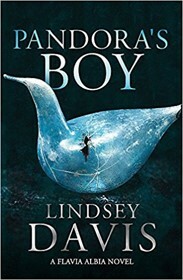 It is always a pleasure to read a new Lindsey Davis Roman detective story, and her latest is no exception. It appears that Falco's adopted daughter, Flavia Albia has taken over her Father’s professional informer business. Needless to say, Flavia has learnt a great deal from her father, who is now a successful antique dealer and auctioneer (but only trust him if you are close family). Albia has acquired a husband, T. Manlius Faustus (Tiberius). Among his various part-time occupations, Tiberius is a magistrate, which may or may not mean he is useful to Albia in her profession. When his former wife, Laia (who Albia detests), arrives at their apartment with a new case for Albia, her instinct is to turn it down. Tiberius thinks she shouldn't, but then he's never been the same since he was struck by lightning at their wedding. Laia explains that friends of hers, a family living on the Quirinal (a very up-market area) have suffered a tragic loss. Their teenage daughter, Clodia, had been found dead in bed by her devoted maid. The Volumnii family are now engaged in a bitter dispute. Clodia's mother believes her daughter was poisoned by a love potion that her two grandmothers had advised her to obtain from a dealer in cosmetics and herbal remedies named Pandora (a well-known supplier to the fashionable Quirinal set). Clodia, apparently, had fallen in love with a young man named Numerius, and wanted to marry him, but her father had refused to countenance the idea as his parents were somewhat suspect. Numerius was one of the smart set that Clodia loved to go around with, although she was several years their junior; but as they all thought her very sweet they let her tag along. Now Clodia's mother wants to divorce her husband for refusing to consider the match. Albia is sufficiently intrigued to take the case on despite her misgivings, and begins her interviews the following day, although she is anxious about Tiberius, who has gone missing. She has been warned that the lightning strike might affect him psychologically. It would be a shame to give away any further details of this complex plot, as Davis’ narrative is as serpentine as it is engrossing; and once again I was struck by the extraordinarily similarity between ancient Rome and contemporary London.